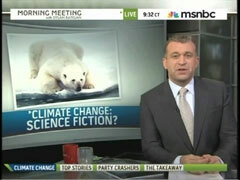 MSNBC’s Dylan Ratigan Slams ClimateGate Fakery: When Will NBC Do the Same? The Morning Meeting host brought on Yale scientist Dan Esty and Michael Shermer, executive director of the Skeptic Society, to debate the revelation that hacked E-mails to a climate change institute show a willingness to fake data. An appalled Ratigan continued, "Because, then, the veil of suspicion or the eye of suspicion is cast upon the entire data set when a certain number of scientists- who are trying to retain their particular political power or role as meaningful advocate and feel threatened by the truth- that hurts the integrity of everything." During the segment, Esty repeatedly asserted that, despite the revelations, the overall science is sound. He did allow that those who fake data should be "condemned." That wasn’t enough for Ratigan. He quickly retorted, "Not only condemned, but punished and eliminated from the conversation. If you want to have a clean data set, you don't keep bad data as a scientist inside your Petri dishes. You just don't." The cable host concluded, "Otherwise it’s not science." At other points, he made his opinion clear. Ratigan cited a poll that shows the number of people who think global warming is a serious threat has dropped from 71 percent to 57. As an aside, he dismissed, "Although, I’m not sure that a poll- it's not science. But then again, maybe the science isn't science." If someone such as Mr. Ratigan, who generally reports stories from the left, can muster outrage and disgust at climate change fakery, then why can’t the anchors and journalists at NBC, CBS and ABC? DYLAN RATIGAN: So-called climate gate. Allegations that scientists have been fudging climate change data in order to support their specific case. It's now threatening to overshadow Monday's start of a U.N. summit on the very subject. NBC News the first to break the news that president Obama will be there along with Energy Secretary Steven Chu. Chrystia Freeland here speculating that the reason they gave Obama that Nobel Prize was to try and box him into going to this summit. One interpretation. Others, obviously, a bit less conspiratorial. But the truth is usually somewhere in the middle. All of the attendees will have to grapple with serious new questions, however you cut it, that suggests research about the dire straits of our Earth is all science fiction. The U.N. says it's looking into dozens of hacked e-mails from renowned scientists. One message encourages those scientists to dodge any freedom of information requests about their research. In light of the science scandal, two members of the Academy, want Al Gore to give his Oscar back. They say his winning film was, An Inconvenient Truth, was in fact, based on scientific lies. But wait, there's more. More evidence of an increasingly skeptical public. A Pew Research poll finds just 57 percent of Americans now think global warming is a serious threat. That is down from 71 percent last spring. Although, I’m not sure that a poll- it's not science. But then again, maybe the science isn't science. Talk about an inconvenient truth for climate change activists. Joining the meeting to talk about now is Dan Esty, Yale University researcher and climate change expert. He served as an environmental expert to President Obama. And from our Burbank bureau, certified skeptic Michael Shermer. He’s the executive director of the Skeptics Society. Dan, what is your perspective on the criticism of the data that's being presented knowing that we're, obviously, dealing with imperfect information? We don't know everything there is to know but we have new, sort of, criticism. How do you respond to it? DAN ESTY (Yale University): Well, it's true we don't know everything there is no to know about science and the science of climate change but that’s not news to people who have been in this policy debate for some time. And I think it's been clear that good scientific background is quite clear on what we know with certainty and what we know with less certainty. ESTY: Let's not overstate that. RATIGAN: Please, put it in context. I don’t want to misrepresent it. ESTY: Yeah- No. There has been debate in Australia and New Zealand and other places whether to go forward with action now or wait for the United States in a global treaty. So, I think that is the context for this. But it is fair to say that this is not a good way to do science. A good science requires people to put their data out in the public, to allow others to review a it and take on critique. And that’s the kind of work that I have always done at Yale. And I think that is the way good science is done. And that you accept there will be uncertainties, that you're clear about what is anomalous, what doesn't fit your theory and lay it out there and then work with it. And life is messy. So is climate science. But, that is, in fact, the right way to go forward and I think what you have to understand here, the basic story hasn't changed. We know that the greenhouse effect is real. We know that the level of greenhouse gas emissions has risen from pre-industrial times. And we're less certainly, frankly, about the speed in which climate change might occur and magnitude it might occur and the regional distribution of harm would be. RATIGAN: Last question and then, Michael, I’m getting you in here. But, what about those who wonder whether there’s a self correcting aspect? ESTY: What do you mean by a self correcting aspect? RATIGAN: Meaning that the atmosphere itself and that the Earth itself will correct for this? ESTY: No. I think there is, in fact, a lot of work being done on issues like that and try to study some of the magnifiers or blunters of potential climate change, things like the ocean and like clouds. So, there is work being done. A lot of effort being put into that but, again, the basic story here is quite clear there is an issue of concern, how quickly it might hit us, who might get hit hardest is uncertain. But you don't wait for the house to burn down to buy insurance. And that is really what this climate negotiation next week is about, getting a global action plan in place that helps ensure that we take this problem seriously. RATIGAN: Understood. Michael Shermer, when you look at this whole debate, what makes you the most skeptical? MICHAEL SHERMER (The Skeptic Society): Well, I used to be a global warming skeptic and largely come around to the science. I think we could tease it apart in five different questions. Is the Earth getting warmer? The data is pretty strong on that, yes. Is the warming due primarily to human causes? Again, the data is pretty strong on that, that that is, in fact, the case although there may be some natural causes as well. Three, how much warmer is it going to get? Well, what is the time horizon? 50 Years, a hundred years, 500 years? And the further out on the time horizon we go, the greater the error bars on our estimates gets. So, it's harder and harder to say. So, here, it's okay to be a little more skeptical. And then, four, what should we do about it? I mean, what are the consequences going to be and so on. There, the error bars are pretty wide and there is room for debate, I think, on how much money we should spend depending on how much warmer we think it's going to get and what its consequences will be. RATIGAN: Go ahead. Real quick on E-mails and also on resistance to revealing the data set to everybody as a good scientist theoretically would, if they are going to assert a conclusion that alters global policy. ESTY: Well, let me just say you really do want to have your debate out in the public. You want to lay out your theory and present the evidence in favor and identify the weaknesses in your case and let that debate go forward. RATIGAN: I get that. But a refusal to do that in those E-mails, Michael, that suggest a resistance to FOIA requests and the like to that data set suggest there could be another motive for the science, Michael. SHERMER: Yep. I worry about that. The E-mails didn't have the smoking guns that I thought they would but show that scientists are politically motivated, just like everybody else. And I do- I am concerned about the strong left leaning nature of many scientists and we need to be more open with the data and get politics out of the debate, if possible. It's not possible completely, but I think- I agree we should publish all of the data and let everybody have a look at it. Too many cover-ups imply conspiracy and that leads- makes people very paranoid about the whole issue of climate change. ESTY: But, lets be fair. There have been hundreds of scientists involved in this debate and the fact that a few of them have confused that role of advocate with scientific researcher doesn't in any way diminish the underlying science which you laid out very clearly. ESTY: And I think it was a fair demonstration and it does highlight the real debate shouldn't be about the science there is some uncertainty but enough clarity to take action. The debate should be around what policy response and real questions there that should be debated. RATIGAN: To the extent which that all has integrity, the perceived integrity of what you are saying is diminished by scientists who appear to be hiding something. Because, then, the veil of suspicion or the eye of suspicion is cast upon the entire data set when a certain number of scientists- who are trying to retain their particular political power or role as meaningful advocate and feel threatened by the truth- that hurts the integrity of everything. ESTY: That's true. I think we should be very clear this is an area where we need to be open, we need to be transparent and we need to lay out the story. People can argue their case, but I think that the fundamentals here don't change and the basic consensus remains very strong across hundreds of scientists and there will, of course, some that don't follow good procedure and we should condemn that. RATIGAN: Not only condemned, but punished and eliminated from the conversation. If you want to have a clean data set, you don't keep bad data as a scientist inside your Petri dishes. You just don't. ESTY: You reveal where things don’t fit. RATIGAN: Otherwise it’s not science.